HMD Global has launched Nokia 's flagship phone, the Nokia 8, in India. The device was announced a month ago, as reported in our previous article. The Nokia 8 features dual rear cameras of 13 megapixels resolution, made by ZEISS optics. The primary sensor is an RGB sensor, and the secondary camera is a monochrome sensor. The RGB sensor supports OIS (Optical Image Stabilization), 4K video recording, 1.12um pixel size, 76.9° angle, an f/2.0 aperture, IR range finder, dual tone LED Flash,PDAF (Phase Detect Auto Focus) and Audio Focus to reduce background noise.The selfie lens on the Nokia 8 is a 13 megapixels camera with an f/2.0 aperture, 1.12um pixel size, a 78.4° wide angle lens. The phone supports "bothies" aka using both the selfie and rear cameras at the same time for photos and videos. The Nokia 8 sports a 5.3-inch 2K QHD IPS polarized display, with 2.5D Corning Gorilla Glass 5, encased in a metal body made of aluminium. The phone has a built-in full-length copper cooling pipe with graphite shield, for dissipating heat over the full phone's body, and is IP 64 certified to be Splash proof. The phone runs on Android 7.1.1 Nougat, which is close to stock OS, and is powered by a 2.5GHz Qualcomm Snapdragon 835 processor with 4GB of LPDDR4X RAM. The Nokia 8 has 64GB of internal storage, and supports up to 256GB of expandable storage via a microSD card slot. (Hybrid SIM).The Nokia 8 has a front placed fingerprint scanner, a USB Type C (3.1 Gen 1) port, and a 3.5mm headphone jack. Speaking of which, the device uses Nokia OZO for spatial 360° surround audio. 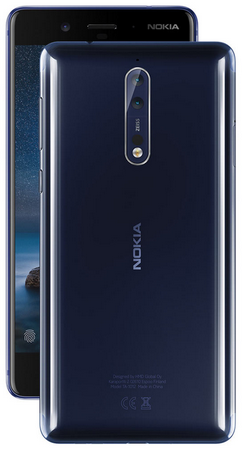 The Nokia 8 supports Wi-Fi 802.11 a/b/g/n/ (MIMO), Bluetooth 5.0, 4G LTE, GPS/AGPS/GLONASS + BDS, NFC, ANT+ and is packed by a 3090mAh non-removable battery. The phone also has the following censors Ambient light sensor, Proximity sensor, Accelerometer, E-compass, Gyroscope, Hall sensor and Barometer. The Nokia 8 has been priced at Rs. 36,999 in India, and will be available in offline stores and on Amazon India's webstore from October 14th.